This 3rd-party game, created by Zukor Interactive, is an excellent biofeedback and neurofeedback training tool for clinicians that are looking for a feedback experience that engages, entertains and keeps their clients invested in the therapeutic process. The game functions with the principle that the client maintains the parameters set for the self-regulation session in order to keep their chosen character flying smoothly across an endless ocean of islands, ships and other planes. The game is structured using point rewards, activated special events and the unlocking new flying characters, from planes, to animals, and fantastical creatures. Both adults and children will appreciate Zukor's Air for the engaging, and yet soothing nature of feedback. A variety of settings and special effects can be set by the clinician, to maximize or minimize the intensity of the in-game features. Zukor's Air represents an excellent follow-up to Zukor Interactive's first feedback game, Zukor's Grind. 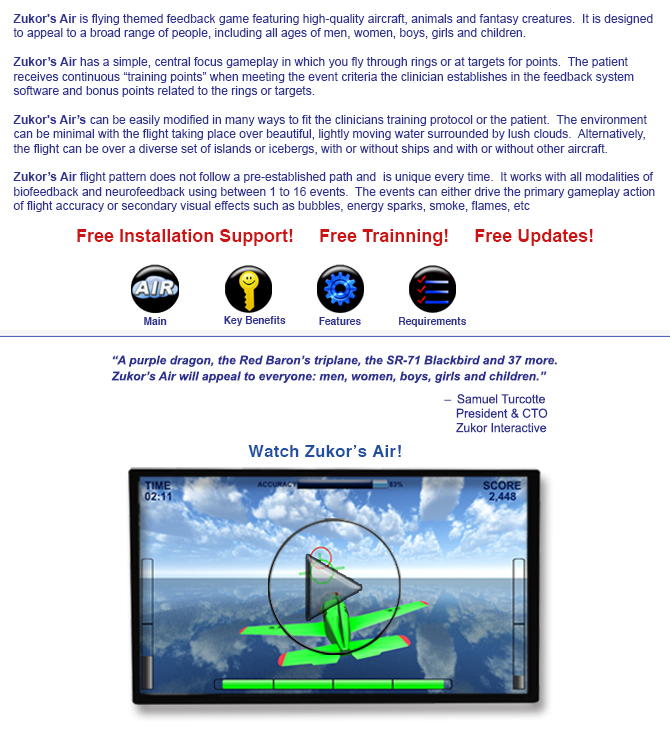 Zukor's Air is available in English, Spanish, German, Polish. French is also coming soon. Upon purchase, a document is presented that explains the download process for Zukor's Air.